Jim Wyatt is an instructor trainer for all PADI/DSAT programs. Call for details if you are interested in becoming a PADI/DSAT technical diver/trimixinstructor. Minimum of 100 logged dives with at least 20 on enriched air, 25 dives deeper than 60 feet and at least 15 deeper than 100 feet. Be certified as a PADI/DSAT Tec 45 diver or have equivalent certification from another agency. The Tec 45 training program may be conducted in conjunction with your Tec instructor program. Be certified as a PADI/DSAT Tec 50 diver or have equivalent certification from another agency. The Tec 45 training program may be conducted in conjunction with your Tec instructor program. Have assisted with at least one DSAT Tec 50 course or one Tec 45 course. Having taught classes, or assisted with equivalent classes from other agencies MAY meet this requirement. Discuss this with me in more detail if you think you have qualified. Have certified a total of ten or more PADI deep divers and/or EANx divers. Any combination of 10 is acceptable. The DSAT Tec Diver 40 course is an entry level technical open circuit diving course. It is part of the DSAT TecRec program. (TecRec is is the encompassing overall name for all DSAT technical diving courses) By definition technical diving takes divers beyond the limits of recreational diving. Recreational diving is considered as no stop diving with nitrox or air to a maximum depth of 130 feet. Technical diving is other than commercial or research diving that takes divers beyond the recreational limits. It is further defined as and includes one or more of the following: diving deeper than 130 feet, required stage decompression diving, diving in caves, accelerated decompression, using various gas mixes during a dive and/or the use of scuba technologies that require discipline, thought, training and attitude beyond thatr required by recreational divers. Technical diving uses extensive methodologies, technologies and training to manage added risks associated with it. Typically this means using complex or highly specialized equipment in situations where direct access to the surface is inaccessible due to a ceiling imposed by a physical barrier such as a cave or wreck, or by decompression. Divers usually technical dive for the challenge and fun rather than as a profession, so it is a recreation. However to avoid confusion regarding the limits and scopes tec diving is not called "recreational diving". The courses in the DSAT TecRec program directly address the more demanding and challenging nature of technical diving,which involves more hazards and inherent risks than recreational diving. Student divers may complete the courses independently, in sequence and IAW course standards, or enroll in the continuous classes from Tec 40 through Tec 50. Because each subcourse qualifies the diver to take on increasing levels of decompression diving and the student may not be able to return immediately for further training, a certification is required at each level as the student completes it. Use a single cylinder of decompression gas with up to 50 percent oxygen (EANx50) to add conservatism to the required decompression. The Tec 40 course consists of knowledge development, three practical application sessions, one confined or limited open water dive, two open water no stop dives (simulated decompression) and one open water decompression dive. Diving cylinder with a minimum of 80 cubic feet with a dual-outlet valve on the cylinder ( .Y. or .H. valve) or 2 diving cylinders at least 80 cft back mount or sidemount. Purpose: PADI Tec 45 course provides a transitional qualification while continuing to develop as a technical diver. The equipment requirements are the same as for the Tec Deep Diver Course. This diver is qualified to make limited technical decompression dives using the equipment and the procedures used at the Tec Deep Diver level. However, qualifications are narrow, reflecting comparatively limited training and experience. The expectation is that a Tec 45 diver plans to continue on to Tec 50. Make single and repetitive dives to a maximum depth of 45 metres/145 feet. Use a single decompression gas of EANx, or oxygen, to accelerate or add conservatism to the decompression. In addition to the Tec 40 course requirements, the Tec 45 course consists of knowledge development, three practical application sessions, one confined or limited open water dive, two open water no stop dives (simulated decompression) and one open water decompression dive. Purpose: PADI Tec 50 course is the complete, entry-level skill set for extensive open circuit deep decompression tec diving (formerly Tec Deep Diver). The diver is qualified to make technical decompression dives within the limits of training and equipment. Use air, EANx and oxygen for multiple stop decompression dives as deep as 50 metres/165 feet using standard open circuit, multiple cylinder (backmount and/or sidemount) tec diving equipment. Use two decompression gases (EANx and/or oxygen) to accelerate or add conservatism to the decompression. In addition to the Tec 45 course requirements, the Tec 50 course consists of knowledge development, two practical application sessions, two open water no stop dives (simulated decompression) and two open water decompression dives. Purpose: PADI Tec Trimix 65 course is a new, intermediate level trimix course that is an option for Tec Trimix Instructors. Tec Trimix 65 extends Tec 50 and bridges to the full Tec Trimix Diver certification. The Tec Trimix 65 diver is qualified to make technical decompression dives within the limits of training and equipment. Use air, EANx, oxygen and trimix with 18% or more oxygen for multiple stop decompression dives as deep as 65 metres/210 feet using standard open circuit, multiple cylinder (backmount and/or sidemount) tec diving equipment. Use two decompression gases (EANx and/or oxygen) to accelerate or add conservatism to the decompression. In addition to the Tec 50 course requirements, the Tec Trimix 65 course consists of additional knowledge development, practical application and an open water no stop dive (simulated trimix decompression). The final open water decompression trimix dive may be combined with the final dive of the Tec 50 course. Purpose: Tec Diver Level 1 is your introduction to Technical Diving. At least 100 logged dives, with at least 20 dives made with Enriched Air, 25 dives deeper than 60 feet and 15 dives deeper than 100 feet. Limits: You'll learn to make gas-switch, extended no-decompression dives using air and enriched air to 40 metres/130 feet. You'll also prepare for and respond to foreseeable technical diving emergencies. Since it is part of the Tec Deep Diver course, you DSAT Tec Diver Level 1 course training will credit towards the DSAT Tec Deep Diver course. Divers will read the appropriate section of their TecRec manual and answer the Knowledge Reviews prior to the practical application portion. A score of at least 80% is required on all exams. Purpose: The Tec Deep Diver course qualifies you to conduct decompression dives up to 165' using Air and Enriched Air. At least 100 logged dives, with at least 20 dives made with Enriched Air, 25 dives deeper than 60' and 15 dives deeper than 100'. Duration: The course will require 3-4 days of diving (including pool and open water sessions), 2-3 academic sessions, and 2 or more equipment configuration sessions. Limits: After successful completion of the DSAT Tec Deep Diver course you'll be able to conduct gas-switch extended no-decompression dives, decompression dives and accelerated decompression dives using air and enriched air to a depth of 50 metres/165 feet. You'll also understand the hazards and risks involved in technical diving, as well as how to prepare for and handle reasonable foreseeable technical diving emergencies. Purpose: For the extreme diver ready to further explore the world of technical deep diving, the gas of choice is trimix. The Tec Trimix Diver course takes you to the outer edges of technical deep diving, and opens the door to pristine dive sites few divers - if any - ever see. Duration: This course is conducted over a period of 4-5 days. Limits: The Trimix Diver course is intended to extend the available depth range for technical divers who are already trained and qualified to use air, enriched air, and oxygen for technical decompression dives to depths beyond 50 metres/165 feet in open water. The Trimix Diver course is intended for technical divers certified as DSAT Tec Deep Divers (or with an equivalent qualifying certification from another training organization). The course extends their depth range capabilities by training them in the use of trimix (a gas mix of helium, oxygen, and nitrogen). A deposit of $200 per diver is required to reserve a space in this program. All dives must be completed to the Instructor's satisfaction. The Instructor reserves the right to require further training and can refuse to issue a certification card if the student's performance does not meet the course standards. The original Tec Deep program can still be taught as a stand alone program. The Tec 40, 45, and 50 courses simply provide a break between classes. The same student manual is still in use for Tec Deep and for Tec 40, 45 & 50. This is an excellent book in my opinion. Some people scoff at it due to a couple of photos in it, but don't be fooled....the content is top notch. 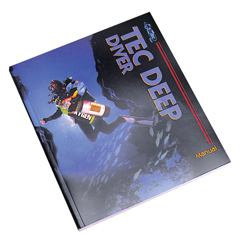 There is a separate instructor manual for Tec Deep & for Tec 40, 45 & 50. The original Tec Trimix program has not chaged. Tec 1 is a new name but not a new program, and was formerly entitled Tec Apprentice. To complete Tec 40, 45 & 50 requires a minimum of 12 dives. Three separate certifications must be issued. To complete Tec Deep requires a minimum of 12 dives. One separate certification is issued. These programs may be conducted in a cave environment if the student meets all requirements for cave. Most of the training we will do at either Orange Grove Sink, Troy Springs, or Forty Fathom Grotto. 2. PADI Enriched Air Diver Specialty Instructor. percent of the desired oxygen content. Manual and PADI Gas Blender Instructor Guide. organization and apply directly to PADI. 7. Assisted with two PADI Tec Deep Diver courses. within 12 months of application. 1. Master Scuba Diver Trainer. 3. Tec Trimix Diver (or qualifying certifi cation). trimix as the bottom gas. with less than 21 percent oxygen.